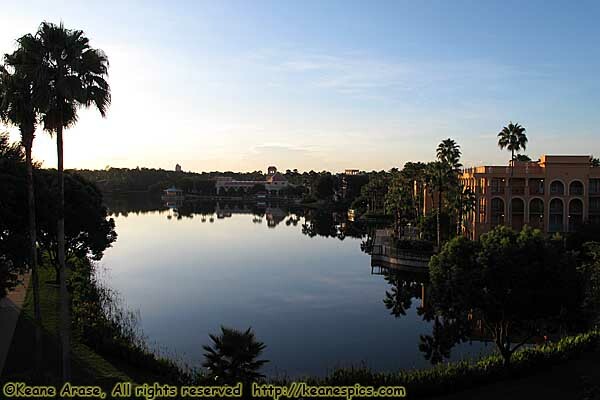 Coronado Springs Resort in the morning... I stayed at CSR in April 2005 and August 2011. 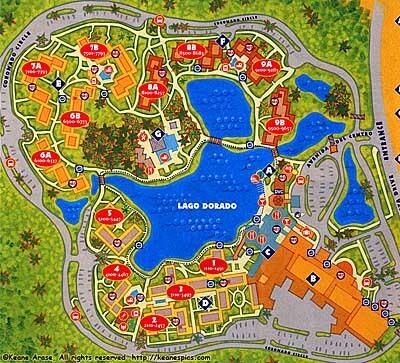 There's 1915 rooms at this resort covering 125 acres, the majority of which is parking and the large central lake, Lago Dorado. The main registration/food court area is known as "El Centro", with an attached convention center and three groups of room areas surrounding the lake. The three room groups are Casitas (buildings 1-5), Ranchos (buildings 6 & 7), and Cabanas (buildings 8 & 9). Talking about buses, they've changed the system. The internal bus that just stopped at all the CSR bus stops no longer exists. Instead, the first stop for all theme park buses is Bus Stop 2 (then 3 and 4) and the last stop in CSR is at Bus Stop 1 (El Centro). So all theme park buses will take you to El Centro. The first stop for the Downtown Disney bus is Bus Stop 1, so the Downtown Disney bus would be the return bus to all of the CSR room bus stops. There are now five food venues at Coronado Springs, six if you count alcohol as a food. One is a quick service by by the feature pool (the Laguna pool bar); Cafe Rix, which is a quick service in El Centro, but has bakery goods, and replaces the packaged food area that used to be by Pepper Market; Rix Lounge, which is actually the bar in El Centro, but you can order food there too; Pepper Market, which is sorta half counter service, half table service; and Maya Grill, the table service restaurant. I ate at all four of the food venues in El Centro, and had consistently good food throughout. I first stayed in this resort in April 2005, and it rained. You could see Expedition Everest being built, if that fits your timeframe better. I stayed here again in August 2011, and it rained. Even harder, I think, if that's possible, than my previous stay. Pepper Market might take some explaining. It is half counter service, half table service, with half the normal amount of gratuity thrown in. Upon entering, each person is given a card, and you are seated like a table service restaurant. They take your drink orders, and even have menus, if you need one. Your sorta wait staff will refill drinks and bus the table. You then take your card, and go to the food area of Pepper Market, where there are different food "stations", such as grilled food, burgers, pasta, pizza, baked goodies, etc. So you go around collecting your food like a counter service. When you collect an item of food, they stamp your card with what you got. Upon exiting, they tally up what you ate at the register, where they add a 10% gratuity. I do have to say the food is a notch above the other moderate counter service places, and probably better than most deluxes. I'd also add it's probably the convention crowd (which is right next to Pepper Market) that drives a system like this. It is designed to handle a lot of people. This was a "standard" room. (It was also the second to last room from the farthest room from the elevator, but I digress.) I am not sure if it was an upgrade, or that it was for making me walk to the next to the last room farthest from the elevator. These pictures are from my 2011 stay. So, yes, I'd recommend Coronado Springs. I'd also recommend paying for a preferred room. If I stay here again, that'd be my choice. The far rooms from El Centro really are *far*, and lake view rooms are overrated at moderates because of the outside corridors.